Do you want to know whether or not a monster lives in Loch Ness? Do you want to know what the various 'monster-hunters' have actually captured and how? This is the only book that will tell you. It is a critical and comprehensive examination of the evidence. How I came to write this book. 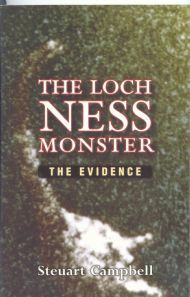 Since I moved to Scotland in 1962, I started collecting press items about the alleged Loch Ness Monster and visited L Ness a few times on holiday. Then, in 1985, I became aware that Aquarian Press, in conjunction with The Association for the Scientific Study of Anomalous Phenomena, were planning to produce a series of books on mysteries under the editorship of Hilary Evans. Since I knew Evans, I asked him who was writing the book on Nessie (assuming that there would be one). It turned out that no one had been commissioned to do so; instead I was asked if I would write the book. I spent the next year researching the matter in depth (no pun intended) and provided a draft in 1986. It was my first book. The form of the book was not my choice. Because the publishers did not want to give the impression that the mystery was solved, they preferred me to trawl through the evidence, only allowing me to express my own conclusion in the final chapter. That is why the title appears so non-committal. I now think that the incident that started modern stories of Nessie (by report by Mr and Mrs Mackay relayed by Alex Campbell to the Inverness Courier, see p. 18 of the book), was stimulated not by sight of an otter but by sight of a wave, probably caused by the wake of a large vessel. The report of an 'enormous black body rolling up and down' is more consistent with a wave. Also, the report by D Mackenzie (p. 17 of the book) was probably of a wave. P2: 1982 by Jennifer Bruce (p. 40): revised interpretation. It is now clear that the object is a bird, perhaps a gull, flying through the scene unnoticed as she took the picture. Copyright Steuart Campbell 2015 - All Rights Reserved.